What does the affinity number represent? The affinity metric appears below ad groups after they have been regrouped.It is a metric that ranges from 1 to 10 and represents the strength in similarities between keywords in an ad group. You can use it to gauge how tightly related the keywords in an ad group are, a higher number meaning that keywords are highly related. 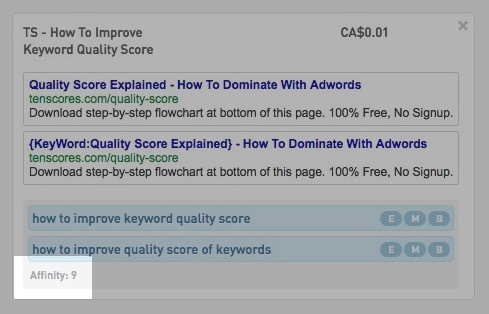 You can also choose (point 4) what the minimum affinity you want your keywords to be grouped by in order to make your ad groups even more tightly grouped.